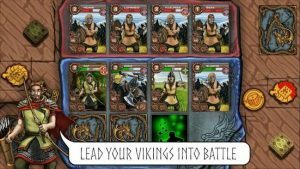 Valhalla Road to Ragnarok : Your goal is to conquer land and rule Scandinavia by leading vikings into battle. Wits and a bit of of luck helps you to raid and pillage in this strategic card battle game. Card battles where you plan your deck to gain an advantage. Conquer land on the board to get income, treasure & cards. Make allies with other players to strengthen your empire. Raid other players to challenge their card decks and gain bonuses + a bounty. Get stronger by leveling up, upgrading cards & collecting mastery points. Vikings are divided into three tribes; swedish, danish and icelandic.